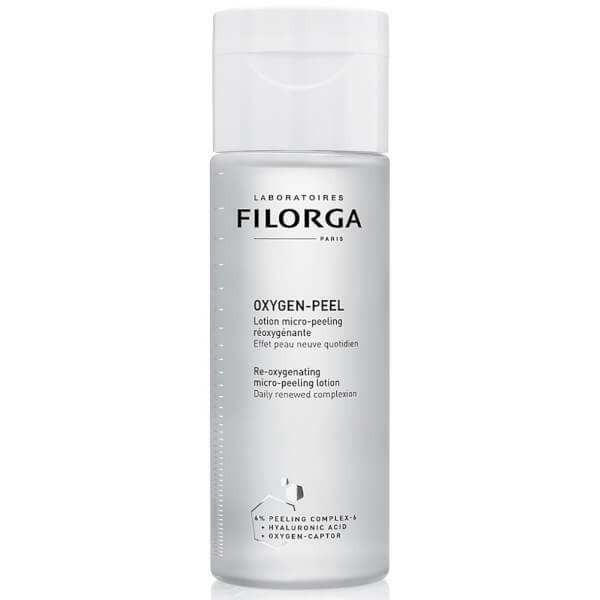 Reveal a radiant complexion with Filorga Oxygen Peel, a daily treatment that transforms the texture and appearance of skin for a visibly youthful look. Working to combat the effects of environmental stressors and fatigue, the anti-ageing face lotion uses miracle ingredient Hyaluronic Acid to restore moisture and plump the skin to reduce the appearance of fine lines and wrinkles. Bio-Active Oxygen Sensors stimulate the production of oxygen in cells, which refines pores and smooths the skin surface for a fresh, balanced visage. 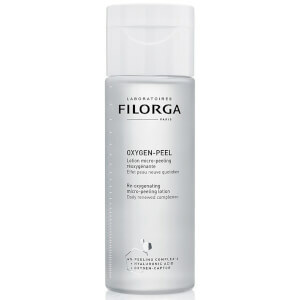 Moisturising and exfoliating, the face cream brightens the complexion for skin that radiates health. Aqua (Water), Gluconolactone, Alcohol, Propanediol, Sodium Hydroxide, Capryloyl Glycine, Phenoxyethanol, Sodium Citrate, Peg-60 Hydrogenated Castor Oil, Pentylene Glycol, Methyl Diisopropyl Propionamide, Glycolic Acid, Citric Acid, Disodium Edta, Mandelic Acid, Parfum (Fragrance), Phytic Acid, Salicylic Acid, Tropaeolum Majus Flower/Leaf/Stem Extract, Sodium Chloride, Sodium Hyaluronate, Glucose, Ethylhexylglycerin, Potassium Chloride, Calcium Chloride, Magnesium Sulfate, Glutamine, Sodium Phosphate, Ascorbic Acid, Sodium Acetate, Lysine Hcl, Arginine, Alanine, Histidine, Valine, Leucine, Threonine, Isoleucine, Tryptophan, Phenylalanine, Tyrosine, Glycine, Polysorbate 80, Serine, Deoxyadenosine, Cystine, Cyanocobalamin, Deoxycytidine, Deoxyguanosine, Deoxythymidine, Glutathione, Asparagine, Aspartic Acid, Ornithine, Glutamic Acid, Nicotinamide Adenine Dinucleotide, Proline, Aminobutyric Acid, Methionine, Taurine, Hydroxyproline, Glucosamine, Coenzyme A, Glucuronolactone, Sodium Glucuronate, Thiamine Diphosphate, Sodium Uridine Triphosphate, Disodium Flavine Adenine Dinucleotide, Retinyl Acetate, Inositol, Methyl Deoxycytidine, Niacin, Niacinamide, Pyridoxal 5-Phosphate, Pyridoxine Hcl, Biotin, Calcium Pantothenate, Folic Acid, Riboflavin, Tocopheryl Phosphate.